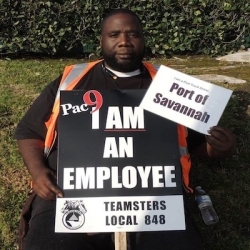 A Savannah port truck driver protests for employee status at a port worker strike in Los Angeles last year. “Everyone that’s involved in container hauling is making money,” says Albert Dantes, a port truck driver at the Port of Savannah, Georgia. Everyone, that is, but Dantes and his colleagues, who spoke to me after an organizing meeting just off the highway on which they haul the goods that come in and out of the fourth-largest container port in the country.